Bake biscuits as directed on can. Meanwhile, in 10-inch skillet, cook beef over medium heat 8 to 10 minutes, stirring occasionally, until thoroughly cooked; drain. Add taco seasoning mix, water and salsa. Cook about 2 minutes or until hot. Cut biscuits in half horizontally. Place beef mixture on bottom half of each biscuit. 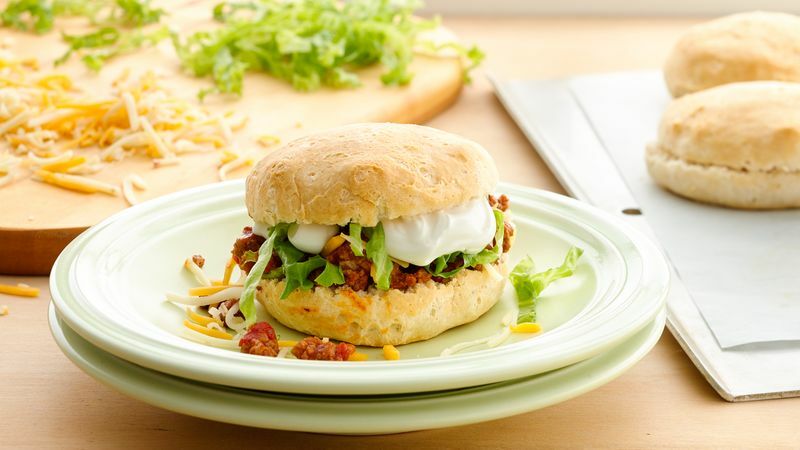 Top with cheese, lettuce and sour cream, followed by biscuit tops. Serve these sandwiches topped with guacamole and chopped fresh cilantro.